Find out which retailers came out on top in areas such as customer service and online experience. Consumers also weigh in on apps, online vs. brick-and-mortar, loyalty programs and more. The world of retail has become increasingly challenging in the past few years, thanks in part to a sluggish economy. In spite of that, many brands continue to provide an exceptional customer experience that gains the loyalty of shoppers. RetailCustomerExperience.com surveyed more than 1,000 customers to discover their feelings about many of the top retailers in the country. In this 55-page report, find out which retailers came out on top in customer service, aesthetics, online experience, product variety and use of technology. For the first time this year, we have added a second component. This second part takes a deeper look at how customers are interacting with brands in similar areas related to the customer experience. We examine their preferences for loyalty programs, what retailers they follow on social media, how they use and respond to in-store technology and more. Click here to view the table of contents. 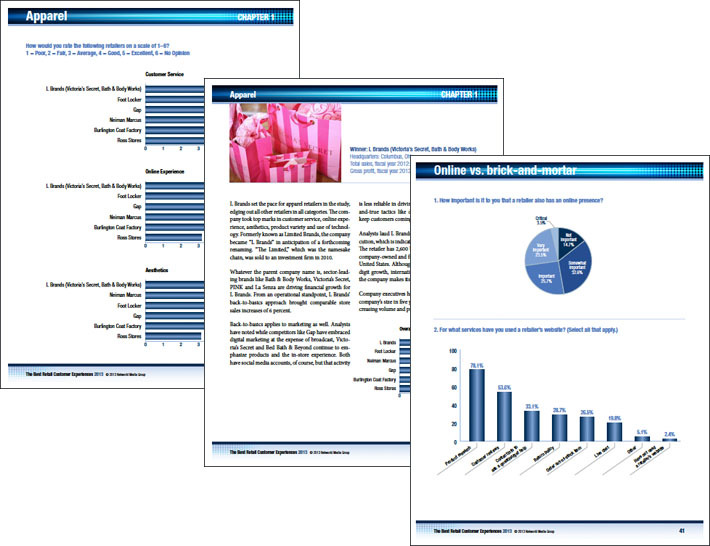 Also included: 87 charts and graphs that breakdown consumer thoughts on all aspects of the customer experience.